Home » Complex Analysis » What is the Best Proof of Cauchy’s Integral Theorem? My book on Complex Analysis is now available! You can find it at xtothepowerofn.com. The material below is there along with other sample chapters on Common Mistakes and on Improving Understanding. Today’s post may look as though I’m going all Terry Tao on you with a long post with lots of mathematical symbols. It’s really about the learning and teaching of Cauchy’s integral theorem from undergraduate complex analysis, so isn’t for everyone. If it’s not your cup of tea/coffee, then pop over here for some entertainment. Cauchy’s Integral Theorem: Let be a domain, and be a differentiable complex function. Let be a closed contour such that and its interior points are in . Here, contour means a piecewise smooth map . In my years lecturing Complex Analysis I have been searching for a good version and proof of the theorem. My definition of good is that the statement and proof should be short, clear and as applicable as possible so that I can maintain rigour when proving Cauchy’s Integral Formula and the major applications of complex analysis such as evaluating definite integrals. Many of the proofs in the literature are rather complicated and so time is lost in lectures proving lemmas that that are never needed again. Here’s a version which I think has a good balance between simplicity and applicability. I’ve highlighted the difference with the version above. Cauchy’s Integral Theorem (Simple version): Let be a domain, and be a differentiable complex function. Let be a simple closed contour made of a finite number of lines and arcs such that and its interior points are in . Here an important point is that the curve is simple, i.e., is injective except at the start and end points. 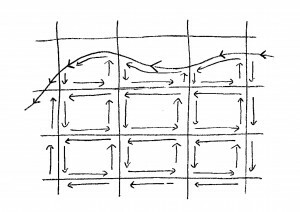 This means that we have a Jordan curve and so the curve has well-defined interior and exterior and both are connected sets. With this version I believe one can prove all the major theorems in an introductory course. I would be interested to hear from anyone who knows a simpler proof or has some thoughts on this one. 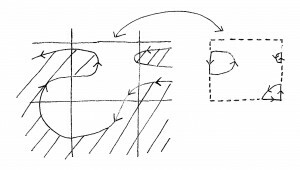 Let denote the interior of , i.e., points with non-zero winding number and for any contour let denote its image. First we need a lemma. The set up looks like the following. For a contradiction we will assume the statement is false. Let and divide into 4 equal-sized squares. At least one of these squares will not satisfy the required condition in the lemma. Let be such a square. Repeat the process to produce an infinite sequence of squares with .By the Nested Squares Lemma (which is just a generalization of the Nested Interval Theorem) there exists . As is differentiable there exists such that for . But as the size of the squares becomes arbitrarily small there must exist such that is contained in the disk . This is a contradiction. Given there exists a grid of squares covering . Let be the set of squares such that and let be the set of distinguished points in the lemma. Then as is differentiable, is continuous (and hence integrable). Without loss of generality we can assume that is positively oriented. Let be the union of positively oriented contours giving the boundary of . Since is made of a finite number of lines and arcs will itself be the union of a finite number of lines and arcs. For such that , is just the boundary of a square. and edges of touching squares will cancel. by (1) and (2). We now estimate each of the integrals in the sum. Let be the length of the side of the squares. For we have because as is a square and as the grid of squares satisfies the conclusion of the lemma. where is the area of all the squares . Now is less than or equal to the length of the side of the original square enclosing . For a teacher what’s good about this way of proving it? Well, it means you have rigorously proved a version that will cope with the main applications of the theorem: Cauchy’s residue theorem to evaluation of improper real integrals. For these, and proofs of theorems such as Fundamental Theorem of Algebra or Louiville’s theorem you never need more than a finite number of arcs and lines (or a circle – which is just a complete arc). Also, the proof is divided into distinct sections rather than being mixed up. The standard proof involving proving the statement first for a triangle or square requires a nesting during which one has to keep track of an estimation. In the proof above the nesting is separated from the estimation and hence, I believe, is easier to understand and follow. Furthermore, standard proofs then have to move to a more general setting. Usually this is achieved by applying the triangle result to show that the on a star-shaped/convex domain an analytic function has an antiderivative. This can then be used to prove a version of the theorem involving simple contours or more general domains such as simply connected spaces. The proof above can also be followed with a generalization to more complicated contours and domains but I think for an introductory course with not much time to give all the details, then this is unnecessary. Anyone who is interested will be able to find a proof of the more general version. One flaw in almost all proofs of the theorem is that you have to make some assumption about Jordan curves or some similar property of contours. I think this is unavoidable but at least the Jordan Curve Theorem is intuitively obvious so I feel justified in not proving it. Thanks to Matt Daws for conversations about this proof and to Steve Trotter for typing the original Latex. theorem I have ever known. complex analysis. Thank you very much. If I’d been a student in your class when you gave the proof, then I’d would have walked out right away, gone to the Registrar’s office, dropped the course, and told everyone that what you were doing was less clear than mud, total junk mathematics. I’d upchuck. First, what the heck is C? You need to say. I’ve used C as a convex set, a closed set, a constraint set, etc. Maybe, I’m guessing, you mean that C is the set of complex numbers. SAY SO or DROP it. Next, what the heck is a ‘domain’. I should not have even zip, zilch, zero idea and don’t. Any assumption I’d make would be sloppy leaving me wide open to attack. You need a definition. Can a ‘domain’ be empty? Is it convex, connected, simply connected, closed in the usual topology of C, or what the heck? As soon as you mentioned ‘domain’ I’d be on the way to the registrar’s office. Need to DEFINE ‘domain’. Next, I deeply, profoundly, hated and despised everything I heard about functions of a complex variable as totally useless mental self abuse, from Hille, Ahlfors, Rudin, etc. and heavily because of the totally goofy definition of differentiation. And, why the heck would I care about a function of a complex variable — in practice I’ve never had one. Complex valued, sure; complex variable, never. And I don’t think I want one. So, when you mention differentiable, you MUST give a definition so the rest of us know what wacko, goofy version of differentiation you are using. I’ve worked with the gradient, Frechet derivatives, Dini derivatives, sub-gradients, and supporting hyperplanes — what the heck do you mean? Without that definition, right, off to the Registrar’s office. Else I’m doing sloppy mathematics and leaving myself open to attack. Next, you said there was a ‘closed’ curve. What the heck do you mean by ‘closed’? ‘Closed’ in the usual topology for C? To be clear, you should define what you mean by a ‘curve’ — we’re talking a C valued function with domain [0,1]? And the function is continuous? Differentiable? Rectifiable? A sample path of Brownian motion? Some space filling curve? What the heck? You just GOTTA say. Then you draw those little boxes, and I’m supposed to be convinced that such is mathematics? No thanks. Off to the Registrar’s office. 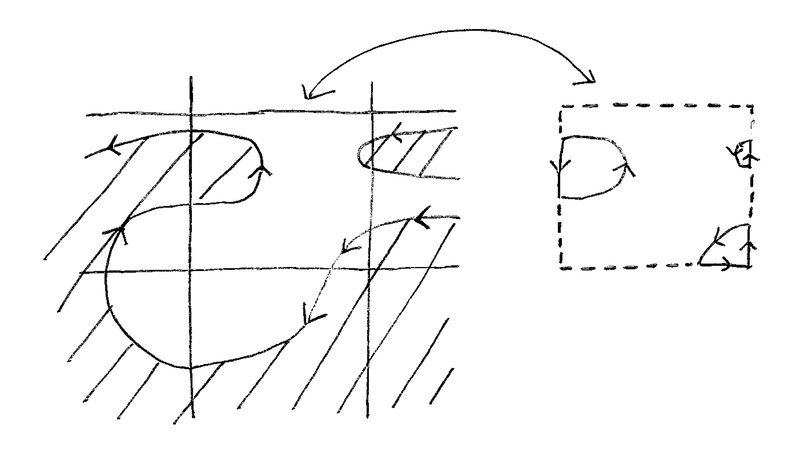 If I start doing mathematics by drawing little boxes, then I will leave myself open to terrible errors and attacks. No boxes. And, no pictures. Pictures are NOT proofs. Let me guess: The result is due to the goofy definition of differentiability in functions of a complex variable and would not hold for the function f with domain R^2 instead of C.
I hope you don’t hurt students trying to learn, drag them off into nonsense land, and give them lessons in writing mathematics while omitting the definitions. This seems a very strong reaction to the proof. (And I’d love to see someone ‘upchuck’ in my class because of a proof.) Anyhow, if you had been in the class you would have seen the definitions in earlier lectures. The definitions are fairly standard in introductory complex analysis so anyone who stumbled on this online would have no major problem understanding the proof. And if I had a student who asked which definition I was using, I would probably turn all Socratic on them and ask which one they thought would be best. In this case the definition is not goofy. Symbolically, it is the same as the real definition via limits but the numbers are allowed to be complex. As for drawing pictures, I’m a geometer so every proof should have a picture. Their aim is to explain. Not allowing pictures would be the same as saying that you are not allowed to use those funny squiggles of lines and circles we call writing. I find your selection of premises good. meaning becomes obscure for beginners. Couldn’t agree more. 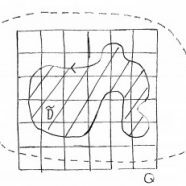 The approach in my forthcoming book about complex analysis uses very little about topology. Of course, it should be noted that this approach does have the downside that students don’t realise just how much one can motivate topology using complex analysis because they have never seen it used in that context. that can be used for all purposes. The cauchy’s integral theorem should be tailored to its use. Its preconditions may vary according to how the theorem will be used. what does “formula does not parse” mean? Is that a bug of some sort? Thanks for pointing that out. It is a bug. Maybe the latex program has changed. I’ll check this weekend. Thanks. Looks a clear proof to me. Nice and concise. Thanks. I’ll update the pictures soon as I made proper versions for my forthcoming book on Complex Analysis. where x and y respectively denote the x and y axes. θ is the argument of z and is defined as θ = arg(z) = . 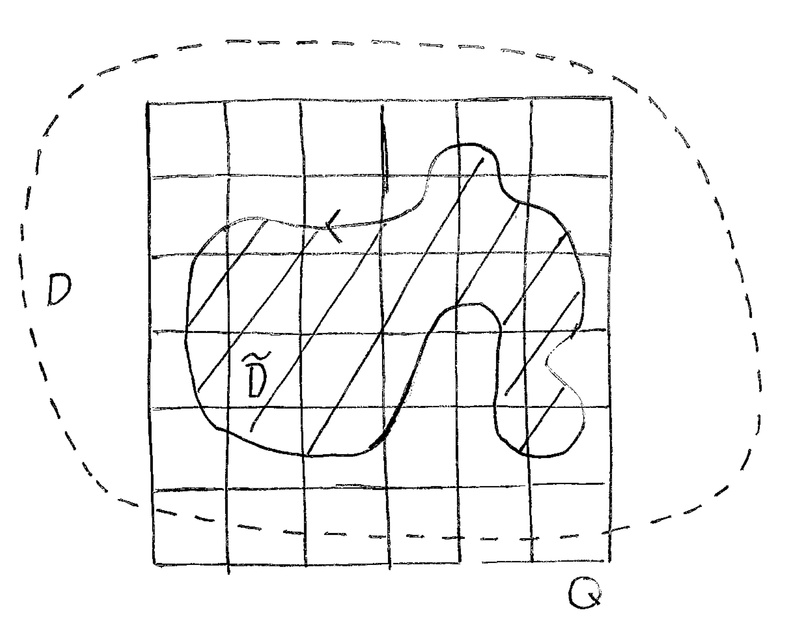 Should we need to show that the Jordan curve \gamma crosses only finitely many times each square S_j ? Surely it’s “obvious” that the local smoothness guarantees that. Good question! It’s because there are many weird and wonderful functions out there. Consider the function f on R where f(x)=x^2*sin(1/x) for x not equal to 0 and f(0)=0 at x=0. This is differentiable at 0. Now, consider its graph. It meets the x axis infinitely often “near” 0. So if we were to consider the interval [0,1] as playing the role of the side of one of the squares in the proof of Cauchy’s Theorem, then we will have an infinite number of pieces of curve within our square. Hence we will have an infinite sum when we sum all the resulting integrals. And of course when you have an infinite sum you need to worry about whether it converges. Checking this convergence would add a lot more to the proof. By restricting to a finite number of arcs and lines we avoid this problem. What is the definiton of a curve of “finite number of arcs and lines”, is it the same as the piecewise smooth curve? Since every piecewise smooth curve if locally linear we can pick such a grid that the curve creates a x- or y-simple domain within every square, and therefore we can do that summation. 1. It’s easy to prove that the integral of a continious and complex-valued function along a closed rectifiable curve can be approximated with a polygon. (see e.g. A Course in Mathematical Analysis, Volume 3 – Garling, p. 680.) And of course every closed and piecewise smooth curve is rectifiable. 2. It’s easy to show by induction that every simple polygon can be triangulated into finitely many triangles. 3. With Goursat’s method we prove the special case of Cauchy Theorem for triangles. 4. With induction we prove that the sum of the curve integrals along all the positively oriented triangles equals to the positive oriented boundary integral of the polygon, and we are done. The definition of a curve with a finite number of arcs and lines is not the same as piecewise smooth curve. It is piecewise smooth curve where the pieces are either lines or arcs (the latter is some part of a circle). I think your outline of a proof for the theorem will work. My reason for using my proof is its simplicity. It mostly relies on the Estimation Lemma and some intuitive geometrical results. 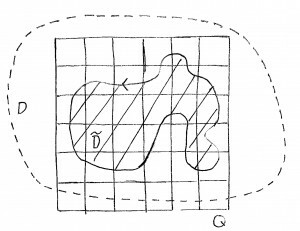 Garling’s proof of approximation by polygons involves uniform continuity, density, and some not very obvious choices. It’s about a page and half and that’s before we get to triangulating the polygon, Goursat’s theorem and so on. In my recent book on Complex Analysis (Plug: https://www.amazon.co.uk/Complex-Analysis-Introduction-Kevin-Houston/dp/1999795202/ref=sr_1_2?s=books&ie=UTF8&qid=1518471265&sr=1-2 ) I keep things simple and by restricting to lines and arcs the proof only takes a few pages. There is an appendix and some exercises that explain how to prove the more general version with any piecewise smooth curve. 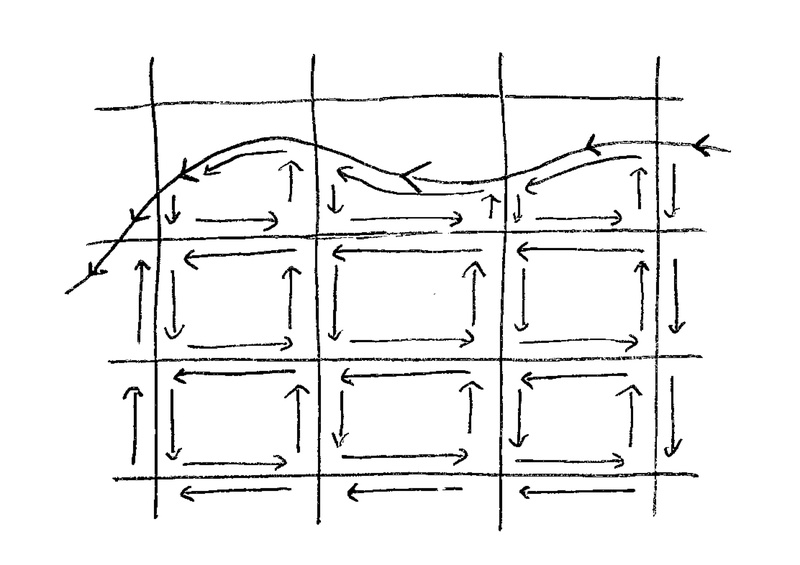 We can begin your proof by choosing such a grid that the size of the squares is so small that the piecewise smooth Jordan curve crosses at most two boundary points of every square that it meets (by local linear approximation and the fact that the curve is simple so there is a neighbourhood where it doesn’t cross itself). Then we prove the usual lemma and choose smaller squares if necessary, and then we can safely sum over all the squares and end up with a fairly general version of the Cauchy Theorem. It can be taught in a more simpler way.